Paleontologists Find An Ancestor Of T.Rex In Utah. It's Small. A reconstruction of North America's newest tyrannosaur, Moros intrepidus. 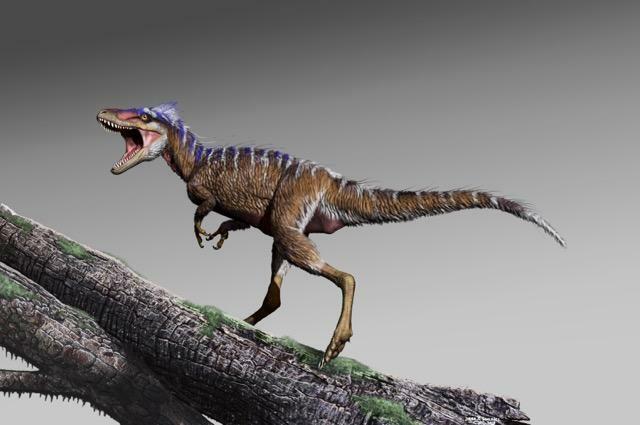 Paleontologists have found a new species of tyrannosaur based on fossils in Emery County, Utah. Lindsay Zanno found the fossilized leg bone sticking out of a grey hill in a part of Utah where landmarks get names like "Cliffs of Insanity" and "Suicide Hill." "I knew right away it was something interesting, but we didn't know for a long time what it was," says Zanno, a paleontologist at the North Carolina Museum of Natural Sciences and NC State University. "It took a long time of sort of meticulous anatomical research to try and figure out what type of dinosaur it actually belonged to." The tyrannosaur, dubbed 'Moros intrepidus,' is an ancestor of T-rex, with legs built for speed an a surprisingly small body. "Moros is about the size of a large deer," says Zanno. "This is an animal that would have stood about four feet at the hip or maybe five feet at the head. Moros could have looked you directly in the eyes." As Zanno and her colleagues write in the journal Communications Biology, the fossil suggests that tyrannosaurs in North America were quite the underdogs among dinosaurs until climate change did in the top dogs of the time, the allosaurs. Then, the deer-sized tyrannosaurs ballooned and took over, growing to be about ten times as big and ascending to the top of the food chain. "We were surprised at how tiny of a tyrannosaur Moros is," says Zanno. "It tells us that once allosaurs went extinct on the North American continent, these tiny tyrannosaurs were able to increase their body mass by about ten times in a span of just about 10 to 15 million years. That's really short in evolutionary time. So they were obviously very sophisticated animals that were ready and primed to ascend to those top roles when given the chance." Zanno and her colleagues captured some of the animal’s dramatic exit from its "prolonged stint as marginal predators" in the little guy’s name, Moros. It’s Greek for "the embodiment of impending doom."